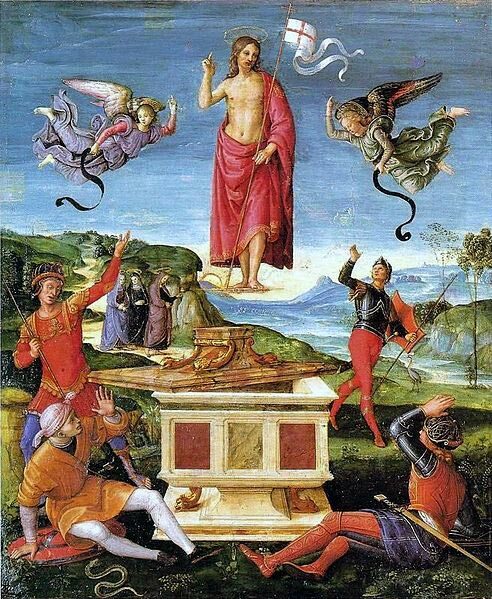 Raphael Sanzio of Italy painted the Resurrection of Christ. The medium for this work of art is oil on panel. It was created between the years 1499 to 1502. It measures fifty two centimeters by forty four centimeters. This painting is also called The Kinnaird Resurrection as can be attributed to its previous owner named, Lord Kinnaird. This is one of the very first work of Raphael where it can be said that his naturally dramatic style of art became apparent. Instead of having the influence of his mentor Perugino’s gentler style, this work can be said to be more aesthetically influenced by Melozzo da Forli & Pinturicchio because of the spatial synergy.